Alan Rothenberg has been a major figure in Southern California professional sports for nearly 25 years. In the contemporary sports climate, he is the founder of Major League Soccer, Chairman-CEO of World Cup USA 1994, was president of the United States Soccer Federation (1990-1998), and Board Chairman of the 1999 FIFA Women’s World Cup. 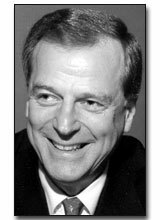 Rothenberg first gained local prominence as Vice President and General Counsel for Jack Kent Cooke, Inc. and California Sports, Inc. (L.A. Lakers and Kings, and The Forum). He became member of the Board of Governors of the National Basketball Association in 1971, serving through 1979; and again from 1982-89, when he was President of the NBA’s Los Angeles Clippers. The one-time Vice President of West L.A.’s Sinai Temple was Chairman of Aztec Sports Limited, 1977-80, owner of the Los Angeles Aztecs of the North American Soccer League, and served on the NASL Board of Directors during that period. He has also been a commentator on ESPN’s “Sportslook” (1981-90), and continues to serve on the American Bar Association’s Entertainment and Sports Law Forum (since 1979); and is Chairman of the Sports Law Committee, on which he has been a member since 1986. Alan was Soccer Commissioner for the 1984 Los Angeles Olympic Organizing Committee, and U.S. Soccer Chairman for the World Maccabiah Games in 1991. He chaired the Jewish Sports Hall of Fame induction dinner in Beverly Hills in 1980, an event that led to the establishment of the International Jewish Sports Hall of Fame Museum in Netanya, Israel. Among his numerous awards and honors, Alan was recipient of the Boy Scouts of America’s Vincent Lombardi Award in 1984, and the Soccer Industry Council of America’s Sherman Award in 1994.